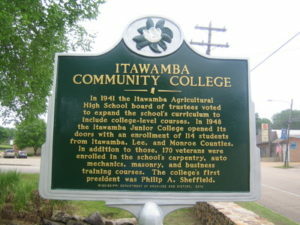 Itawamba Community College the #1 community college in the state, began as an extension of Itawamba County Agricultural High School, one of the largest high schools in Mississippi, which was organized in 1920. In 1941, the trustees extended the curriculum to provide for two years of college work. However, World War II postponed the plans for buildings and equipment to pursue college status. In March 1948, the boards of supervisors and school boards of Itawamba, Lee, and Monroe counties unanimously agreed to support Itawamba Junior College. A full freshman college curriculum was offered for the first time in 1948 to 114 students. 170 Veterans were also enrolled in carpentry, mechanics, masonry, and business training courses. Pontotoc County began supporting the institution in 1953, and Chickasaw County in 1972.